The Toilet Pan Surround Frame by Hero Medical has been designed to fit around the toilet pan. The handles are slightly angled to provide better leverage and also provides support for the user when lowering onto or rising from the toilet pan. The Hero Medical Toilet Pan Surround is made of Aluminium construction and is fitted with slip-resistant rubber tips for safety. The handle are slightly angled to provide leverage when rising from the toilet seat. 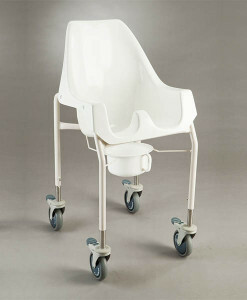 With extension legs, the height of the toilet surround can also be adjusted.